These are two sister ships with different owners, routes and home ports in the Philippines and probably their paths do not cross and few are aware one has a sister ship or ever more saw both of them. I wrote about them not because they are that superlative but I think they have some uniqueness and I would like to compare them to a sister ship series that has just started arriving in the Philippines. These are mainly represented by the new ships of Starlite Ferries which all arrived here brand-new from Japan from a big loan package and ostensibly a push for shipping modernization in the Philippines. One thing I noticed about the new Starlite ferries is their breadth which is on the large or wide end. Few are the 60-meter ferries that have 14 meters as breadth (most have breadths just in the 12 to 13 meter range) but the breadth of the new Starlite Ferries is 15.3 meters. There are just a few ferries in the Philippines that are in the 60-meter class that have 14 meters in breadth but the sister ships Stephanie Marie and Starlite Annapolis have the widest breadth at 14.2 meters and so the new Starlite ferries has an extra 1.1 meters over them. Now if this extra breadth converts to an extra lane of rolling cargo I am not sure of that. The average width of a truck or bus is just 3 meters and so in the two older sisters ships that might mean 3 buses or trucks abreast as other portions of the breadth consist of the hull and pathways. At their breadth the buses and trucks will not be too near each other which is important in choppy seas to avoid damage. But rolling cargo loading in the Philippines is generally mixed with smaller vehicles like sedans, AUVs, SUVs, jeeps and light trucks. Now I don’t know if in a mix the new Starlite ferries will have a higher total number of vehicles (the lengths of the two sets of sister ships are almost the same). 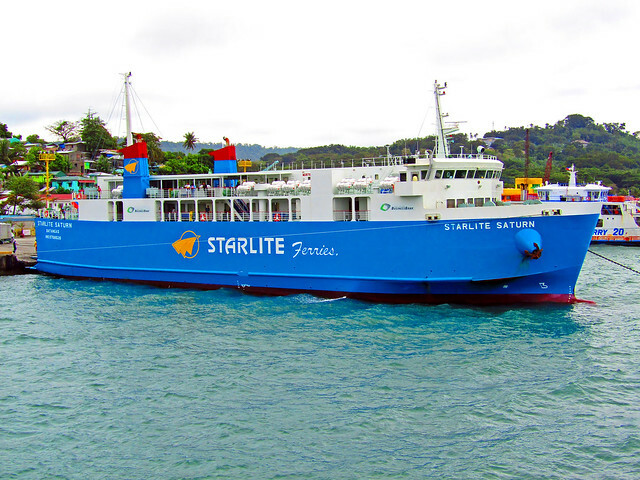 In a maritime database the declared rolling cargo capacity of the new Starlite ferries is 21 trucks. I don’t know how this was computed. At 3 abreast then it must be a row of 7 trucks. But the LOA (Length Over-all) is only 67 meters. Is this the Japan 8-meter truck standard and not our long trucks? I am also interested in the breadths of ROROs because that figure is also needed in estimating the rolling cargo and not just the length. A little extra breadth is actually crucial in packing it in. In the new Starlite ferries they advertised that their stairs are wider. Did the extra 1.1 meters just went into that? Before the arrival of the new Starlite ferries, I looked at Stephanie Marie and Starlite Annapolis as the benchmarks in the 60-meter class of ROPAXes. Viewed from the outside it is obvious they are a little wide and their bow design even emphasizes that. Even from the stern these two sister ships looks wide than tall and to think they both have three passenger decks. Well, this illusion is true even from the bow. Just how wide is the Stephanie Marie and Starlite Annapolis? Well, let me state that in many 80-meter ROROs 14 meters is the common breadth like in Reina del Rosario, Filipinas Cebu, Filipinas Ozamis, Filipinas Iligan and Filipinas Butuan (well, the last two is just a shade under 80 meters), to name a few more famous ferries. In fact the 14.2 meters breadth of Stephanie Marie and Starlite Annapolis are wider than most Cebu overnight ships. 14.2 meters is even the breadth of the 90-meter Super Shuttle RORO 2. Actually before the arrival of the former Cebu Ferries ships Starlite Annapolis has the biggest breadth in the Batangas to Mindoro and Roxas to Caticlan ROPAXes. But then those three former Cebu Ferries average over 90 meters in LOA and so they are substantially bigger than the sister ships and that is the reason why now those three are already regarded as liners. Maybe in that count the two sister ships can be considered superlative. And that is also the characteristic of the new sister ship series of Starlite Ferries, their wide breadth. If that translates into a technical advantage I am not sure of that but probably not. Anyway she has bigger engines than most ships of her class at 3,650 horsepower. The Stephanie Marie of Aleson Shipping of Zamboanga City came earlier than her sister in 1998. She was built as the Marima III in Japan and she has the ID IMO 8427278. This ship was built by Kanda Shipbuilding in Kawajiri, Japan in 1979 which means if 35-year old ships are phased out then she would have to go. She has two masts, a steel hull, cargo ramps at the bow and stern, a single car deck and three passenger decks. Stephanie Marie‘s LOA is 63.2 meters with a Length Between Perpendiculars (LBP or LPP) of 60.9 meters. Her Gross Register Tonnage or GRT in Japan was 910 tons but when that was converted into Gross Tonnage or GT here, the modern measure, it fell to 770 even when an additional passenger accommodations were built. Most likely the “MARINA magic meter” came into play here which shrinks the GTs of the ships for considerations. Her declared Net Tonnage or NT is just 316 and that is probably an underestimation too. The passenger capacity of Stephanie Marie is 956 and this is high because she is a short-distance ferry-RORO just equipped with benches and there are no bunks. She had a large air-conditioned cabin at the front of the ship for the Tourist Class and the very front is actually a lounge and at the side of that is a sort of an open office. Her route is Zamboanga City to Isabela City, the capital of Basilan which has a distance of 14 nautical miles and she does two full voyages a day. A big ship for the route she is seldom full and that gives the passengers a lot of space. But even then she is a profitable ship and there is space in case there is a rush of passengers and vehicles especially since she holds the last trip to Isabela City. Meanwhile, her sister ship Starlite Annapolis of Starlite Ferries in Batangas City held the Roxas-Caticlan route for Starlite Ferries for a long time although she is rotated too in the Batangas-Calapan route. Those were not her original routes as when the ship first came here in 1999 her first owner was Safeship/Shipsafe, two legal-fiction shipping companies that just operate as one and she was known as Princess Colleen. Her original route was actually Batangas to Romblon, Romblon. 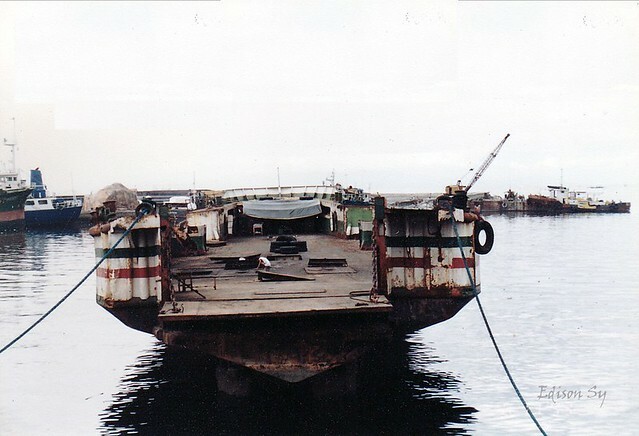 However, when their ship Princess Camille capsized in Romblon port in 2003 the company went into a downward spiral and when she became defunct the Princess Colleen was sold to Starlite Ferries. Princess Colleen was the biggest ship of Safeship/Shipsafe. Princess Colleen was built as the Yoshinagawa of the Blue Line by Kanda Shipbuilding in Kure, Japan in 1982 and so she is the younger of the two sisters. Her permanent ID is IMO 8125624. She has the same external dimensions as the Stephanie Marie but her original Gross Register Tonnage was bigger at 946 tons. Unlike her sister, however, Starlite Annapolis reflected the increase in her passenger accommodations and so the declared GT here is 1,176 (GT is a dimentionless number hence “tons” is not used) which is nearer to reality. Like her sister ship, she is a three-passenger-deck ship. In the number of masts, hull material, cargo ramps and car deck, she is like her sister ship and visually it is obvious they are sister ships although the passenger deck lay-out of the two ships is a little different. The declared passenger capacity of Starlite Annapolis is only 704 passengers which is significantly lower than her sister. The reason is Starlite Annapolis has bunks and maybe that is important for the 4-hour crossing of the Tablas Strait at night. Like the Stephanie Marie, the Starlite Annapolis also has a lounge at the front and the cafeteria is superior than of her sister ship. Maybe that is needed because the transit time of Starlite Annapolis is longer whereas the crossing time of Stephanie Marie is just over an hour and there is no night voyage. In the engine department both ships are equipped with two Daihatsu engines with a total of 3,200 horsepower which is a little high for ROROs their size (and may I note the engine room is too loud when cruising unlike the more modern ROPAXes). Maybe their owners in Japan wanted a little more speed and so their design speeds are both 15 knots which is higher than the design speed (the maximum that can be sustained) of the new Starlite ferries although its power is greater (is that the penalty of having a larger draft?). Of course after three decades of service there is no way the two sisters ships can still run near those speeds and they will be lucky to develop 13 knots now. They might be old, however, but the two are still reliable and profitable ships. I just worry about Starlite Annapolis because her owner is one of the bashers of old ships and he might just simply decide to retire her if he wants to be true to his words. If there is no forced phasing-out of old ships unlike what is pushed by those who have vested interests, I am sure both these ships will last 40 years or more if the record of the ROROs older than them is studied when some examples are already 50 years now. That is one blessing of having Daihatsu engines which have proven to be very sturdy and long-lasting and parts are easy to source or to re-manufacture. Regarding the hull, I am sure its integrity is still good especially since anodes are in wide use now and it is easy to replace damaged hull plates. I will still be watching these sister ships in the next few years for I am impressed with them. Carlos A. Gothong Lines, Inc. (CAGLI), in their online published history claims they were first into ROROs. The more correct term is probably ROPAX or RORO-Passenger but many people just use the acronym “RORO” and that is what is commonly most understood by many. It was said that when new patriarch Alfredo (Alfred) Gothong went on self-imposed exile in Canada, he was able to observe how efficient were the ROROs there and he might have been talking of the short-distance ferry-ROROs including the double-ended ferries in the Vancouver area. It is in that area where Canada has many of those types. The move to ROROs happened when the then-combined shipping companies Carlos A. Gothong Lines, Inc. (CAGLI) and Lorenzo Shipping Corporation parted ways in 1979 (in actual although the agreement was from 1978) after some 7 years of combined operations which they did to better withstand the shocks of the split that created Sulpicio Lines and the downfall of their copra and oil trading (in strategic partnership with Ludo Do & Lu Ym of Cebu) when the Marcos henchmen moved in into the copra trade and oil refining. When Carlos A. Gothong Lines and Lorenzo Shipping were still combined the former’s ships were mainly doing the Visayas and Visayas-Mindanao routes while the latter’s ships were mainly doing the Southern Mindanao and Western Visayas routes. The year 1979 was very significant for Philippine shipping in so many ways. First, it was the year when containerization went full blast when the leading shipping companies (Aboitiz Shipping, William Lines, Sulpicio Lines, Lorenzo Shipping plus the earlier Sea Transport) went into a race to acquire container ships. That also meant a lull in passenger-cargo ship acquisitions since more and more it was the container ships that were carrying the cargo to the major ports. 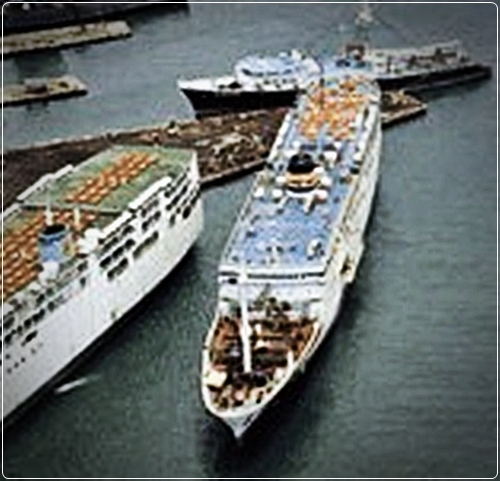 Before the container ships, it was mainly the passenger-cargo ships that were carrying the inter-island cargoes. The shift to containerization resulted in passenger-cargo ships being laid up in 1980 and 1981 and later it accelerated the process of breaking up of the former “FS” ships. Second, it was the year that the road plus ship intermodal system truly started when a Cardinal Shipping ROPAX appeared in San Bernardino Strait to connect Luzon and Visayas by RORO. It was the first step but in the next years ROPAXes linking the islands within sight began to mushroom (this is not to negate the earlier intermittent LCTs that also tried to bridge major islands within sight of each other the RORO way). In their split, Carlos A. Gothong Lines and Lorenzo Shipping had two completely different responses to the new paradigm of containerization. The latter tried to join the containerization bandwagon and aside from the acquisition of general cargo ships from Japan for refitting into container ships it also tried to retrofit their earlier general cargo ships into container ships. Maybe Lorenzo Shipping does not have the financial muscle of the others but it tried to make up for this by ingenuity (and maybe Aboitiz Shipping which first tried this approach was their model). However, Carlos A. Gothong Lines had a different approach. They bypassed the acquisition of container ships and instead went headlong into the acquisition of small ROPAXES (but bigger than the basic, short-distance ferry-ROROs). Most likely their situation as primarily an intra-Visayas and a Visayas-Mindanao shipping operator influenced this. In these routes, there was no need for containers ship as almost all cargoes there are either loose cargo or palletized cargo that are loaded mainly in overnight ships. There is controversy which shipping company fielded the first RORO in the Philippines (setting aside the earlier LCTs). Negros Navigation claims their “Sta. Maria” was first in RORO liners. That ship came in 1980 and it was a RORO liner, obviously. But as far as ROROs or ROPAXes, there is indubitable proof that Cardinal Shipping fielded the “Cardinal Ferry 1” in 1979 in the San Bernardino Strait crossing. To make the debate murkier still, the “Northern Star” (a double-ended ferry at first before she was converted and she became the latter “Northern Samar”) and “Badjao” of Newport Shipping arrived in 1978 but they were not doing RORO routes then. By the way, the San Bernardino RORO service became only feasible when the roads in Samar were already passable so it cannot come earlier. Carlos A. Gothong Lines might win the debate, however, because in 1976 they already had the small RORO “Don Johnny” which they used as a passenger-cargo ship from Manila to Leyte but not as a RORO. 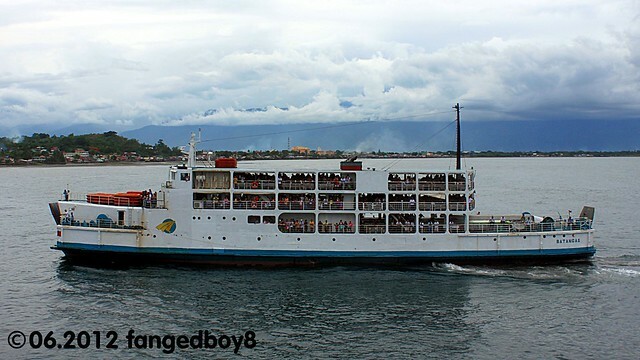 This ship later became the “Cardinal Ferry 2” of Cardinal Shipping that was the first to bridge the Surigao Strait as a RORO (that was not an LCT) in 1980 with a fixed schedule and daily voyages. And even though the former vehicle carrier “Don Carlos” arrived for Sulpicio Lines in 1977, still Carlos A. Gothong Lines was technically ahead in ROROs. From 1980 and ahead of the other shipping companies, Carlos A. Gothong Lines already bet big on ROROs when they fielded such type one after the other. In 1980, the “Dona Lili” and “Don Calvino” arrived for Carlos A. Gothong Lines although there are those who say the former arrived earlier. Negros Navigation might have been right in stressing that their “Sta. Maria” was a RORO liner and was first because the two ROROs of Carlos A. Gothong Lines were just overnight ferries. Nevertheless, both were ROROs or ROPAXes. The “Dona Lili” was a ship built as the “Seiran Maru” in 1967 by Taguma Zosen in Innoshima, Japan. The ferry measured 69.0 meters by 12.0 meters with an original 856 gross register tonnage, a net register tonnage of 448 tons and deadweight tonnage of 553 tons. She was powered by two Daihatsu engines totalling 2,600 horsepower with gave her a sustained speed of 15.5 knots. The permanent ID of the ship was IMO 6713609. In comparison, the “Sta. Maria” of Negros Navigation was not much bigger at 72.0 meters by 12.6 meters and 1,110 gross register tonnage. Their speed was just about the same since “Sta. Maria” has a design speed of just 15 knots. So one ship was not clearly superior to the other. It just so happened that the routes of the companies dictated the particular role of the ships. By the way the “Sta. Maria” is still existing as the “Lite Ferry 8” so shipping observers still can benchmark her size, visually. The “Don Calvino” was built as the “Shunan Maru” by Naikai Zosen in Onomichi, Japan in 1968. The ship measured 62.6 meters by 13.4 meters with an original gross register tonnage of 881 tons. She was powered by twin Hitachi engines of 2,660 horsepower total and a design speed of 14.5 knots. Her ID was IMO 6829484. As a note, the “Dona Lili” and the “Don Calvino” had long lives and they even outlived their company Carlos A. Gothong Lines which disappeared as a separate company when it joined the merger which created the giant shipping company WG&A. Another RORO also arrived for Carlos A. Gothong Lines in the same year 1980. However, the ship did not live long. This ferry was the “Dona Josefina” which was built as “Kamishiho Maru” in 1968 by Mitsubishi Heavy Industries in Shimonoseki, Japan. This ship had the external dimensions 71.6 meters by 13.0 meters and her gross register tonnage was 1,067 tons which means she was slightly the biggest of the three that came to Carlos A. Gothong Lines in 1980 and almost a match to the “Sta. Maria” of Navigation in size (incidentally the two ships both came in 1980). This ship was powered by twin Daihatsu engines of 2,600 combined like the “Dona Lili” and her sustained top speed was 15 knots. Her permanent ID was IMO 6823399. Acquiring three medium-sized ROROs in a year showed the bet of Carlos A. Gothong Lines on ROROs or ROPAXes instead of container ships. Actually in overnight routes, it is ROROs that is needed more because it simplified cargo handling especially with the employment of forklifts which is several times more efficient than a porter and does not get tired. When Carlos A. Gothong Lines acquired RORO cargo ships starting in 1987 with the “Our Lady of Hope” , it was when they had Manila routes already and those cargo ships were used in that route. Carlos A. Gothong Lines then had a short pause but in 1982 they purchased the ROPAX “Don Benjamin”. This ship was the former “Shin Kanaya Maru” and she was built in 1967 by Shimoda Dockyard Company in Shimoda, Japan. This ship measured 61.0 meters by 13.7 meters and the gross register tonnage was 685 tons and her permanent ID was IMO 7022875. She was powered by a single Nippon Hatsudoki engine of 2,550 horsepower and her design speed was 15 knots. Her engine was the reason the ship did not have a very long career here. In 1983, Carlos A. Gothong Lines acquired two more ROROs, the “Dona Casandra” and the “Dona Conchita” which were both ill-fated here. The “Dona Casandra” was the former “Mishima Maru” and built by Hashihama Zosen in Hashihama, Japan. She was smaller than the other ROROs of Carlos A. Gothong Lines at 53.8 meters by 11 meters but her register tonnage was 682 tons. Her engines were twin Daihatsus at 2,000 horsepower total and that gave her a top speed of 14 knots, sustained. She possessed the IMO Number 6729476. The other ship, the “Dona Conchita” was significantly bigger than the others as she had the external dimensions 82.0 meters by 13.4 meters and Japan gross register tonnage of 1,864 tons. This ship was the former “Osado Maru” and she was built in 1969 by Ishikawajima Heavy Industries (IHI) in Tokyo, Japan with the IMO Number 6908187. This bigger ship with a design speed of 16.5 knots was supposedly what will bring Carlos A. Gothong Lines back in the Manila route. However, both “Dona Casandra” and “Dona Conchita” sank before the decade was out. While Carlos A. Gothong Lines was acquiring these ships, they were also disposing of their old ferries including ex-”FS” ships they inherited from their mother company Go Thong & Company before the split in 1972. What they did, the selling of old ships to acquire new was actually the pattern too in the other national shipping companies. The war-vintage ships then were already four decades old and were already in its last legs and its equipment and accommodations were already outdated compared to the newer ships that were already beginning to dominate the local waters. After 1983, Carlos A. Gothong Lines’ ship acquisitions went into a hiatus for three years (but they already acquired six ROROs, much more than the total of the other shipping companies). Well, almost all ship acquisitions stopped then. The crisis that hit the Philippines was really bad and nobody knew then where the country was heading. But in 1986 when the crisis began to ebb and more so in 1987 and 1988 they acquired another bunch of RORO ships, bigger this time including RORO Cargo ships. That was the time that they attempted to become a national liner shipping company again after they became one of the Big Three in Visayas and Visayas-Mindanao shipping (the other two were Sweet Lines and Trans-Asia Shipping). But then, the return of Carlos A. Gothong Lines as a national liner shipping company is worth another story, as they say.